You feel like governor of an adopted patch of earth in a way that’s different from camping near a trail or road. OAKRIDGE, Ore. — There’s something unique about camping on an island. Severed from the mainland and all its inhabitants, you become governor of an adopted patch of earth in a way that’s different from camping near a trail or road. The solitude is deeper and more satisfying — you might score your own swimming hole or viewpoint, and there’s little concern of an obnoxious group showing up next door. But island camping also can be lonely, especially on a solo trip, without even the mainland chipmunks around to keep you company. 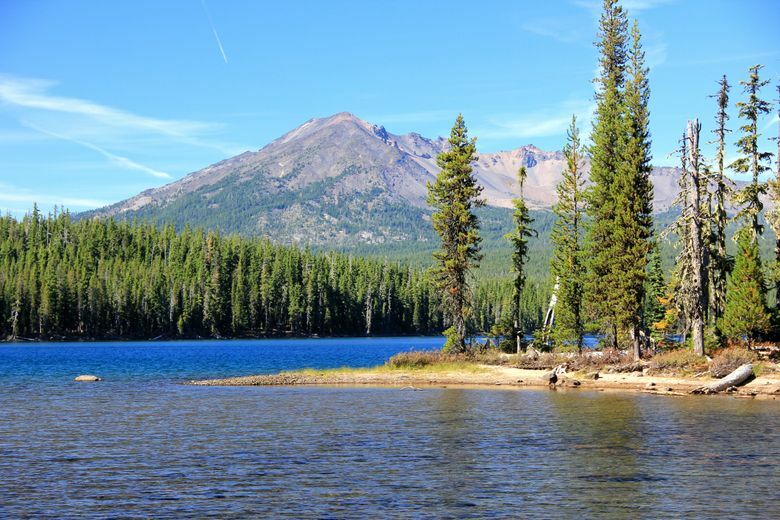 That was my experience, at least, during a trip to one of Oregon’s only mountain lakes where it’s possible to boat in and set up tent on an island. Summit Lake, southeast of Oakridge, is one of the great secret places in the Cascade Mountains not just because of its islands, but also because of the clear water and views of Diamond Peak. Days spent gliding across sapphire water in a canoe or kayak, weaving among islands and peninsulas in search of sand beaches and groves of huckleberries, is an experience close to heaven. Despite these charms, the lake remains uncrowded due to three major problems: awful road access, late snowmelt and mosquitoes. Try driving here in a low-clearance vehicle and your muffler might fall off. Try visiting in June, July or early August and you’ll get massacred by bloodthirsty hordes of tiny vampires that seem to laugh out loud if you try mosquito repellent. 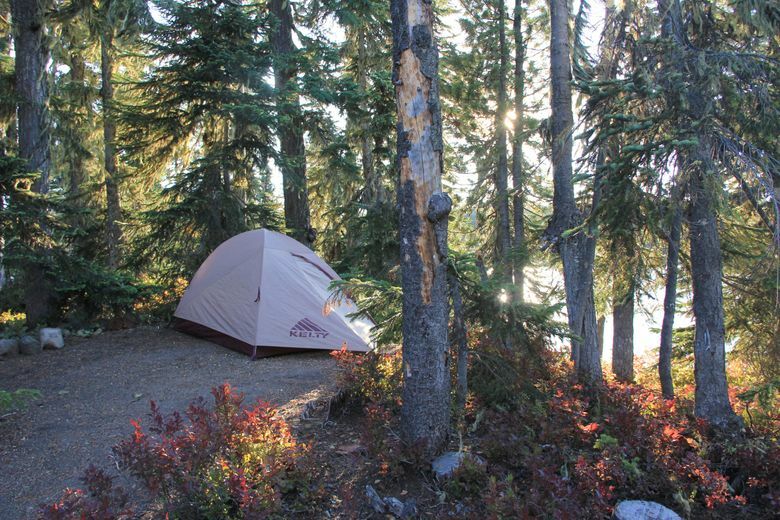 Summit Lake, which also is home to a boat ramp, outhouse and small campground, is a classic high-risk, high-reward outdoor experience. The ideal time to visit Summit Lake is early September, after Labor Day, when the weather is warm enough for swimming but the nights are cool enough to eliminate mosquitoes. I brought my backpacking gear and an inflatable kayak, and made sure to include a shovel. Apparently, some people have trouble understanding the concept of burying their poop on the lake’s islands and the Forest Service has made bringing a shovel a requirement. After driving on Interstate 5 to Eugene, Ore., and heading east on Highway 58, I arrived in Oakridge and was faced with a decision. Summit Lake is located in a sort of no man’s land on the southern border of the Diamond Peak Wilderness, and two routes provide access. The quicker route takes the turnoff to Crescent Lake and follows Forest Service Road 6010, one of the worst roads in the state, to Summit Lake. Full of deep ruts and large boulders, the road is treacherous any time of the year but particularly in early summer due to late snowmelt that makes it easy to get stuck in snow or mud. I opted for the longer route, which follows paved FS Road 21 most of the way and includes less time on awful FS Road 6010. After the less-than-enjoyable drive, I arrived at Summit Lake and got my first view. It is, in a word, stunning. The sparkling blue water rolls across the horizon while Diamond Peak juts overhead like a giant pyramid. The boat ramp, campsite and outhouse are found on the lake’s north end. Upon arrival, I met a family that has been coming here for 20 years. They said Summit Lake gets a fair amount of visitors on August and September weekends but stays mostly quiet midweek. I parked near the boat ramp, inflated my kayak and began loading gear. A canoe would be a better choice, but on a solo trip, I opted for easier traveling. All loaded up, I pushed off from the shoreline and onto the water. The first thing that grabs your attention about Summit Lake is the clarity of the water. At 5,600 feet elevation, the lake is filled by pure snowmelt — there are no inlet creeks — and the rocky geology means there isn’t much sediment either. The result is sapphire-tinted water so clear you can see your boat’s shadow on the bottom of the lake. The majority of boat-in camping spots are on the north end, among a scattering of small islands off a main peninsula that juts into the lake. Some of the islands are too small for campsites, but after boating around for less than 45 minutes, I pulled to the rocky shore of a promising patch of land. 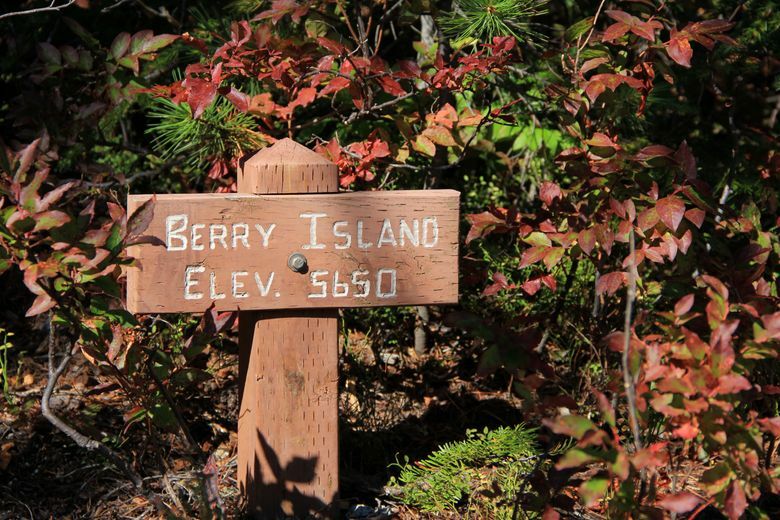 A small wooden sign proclaimed the site Berry Island (elevation 5,650 feet), the perfect nighttime home. There was a giddy excitement in making camp on my own island, of climbing a few steps to its highest point and surveying the breadth of my kingdom. It wasn’t much — less than an acre in size — but it had character. A grove of drooping pines provided shade, and the shoreline included large basalt boulders on one side and a sliver of sand beach on the other. I wasted no time setting up my tent and organizing camp, then celebrating with a cool swim. I spent the rest of the day exploring surrounding islands and peninsulas — and found many other outstanding campsites — and unsuccessfully trying to catch fish. Fishing, from what I was told, is not good here. Nighttime was utterly silent on Berry Island, and, in a small way, I missed the conversations I often have with follow campers. It was a small complaint. The next morning I’d do more swimming and exploring before packing up and leaving Berry Island for the next traveler. There’s something unique about camping on an island, and Summit Lake is a near-perfect place to experience it. Hike the PCT: The Pacific Crest Trail runs alongside Summit Lake and can be hiked to the north or south. Heading north takes you into the Diamond Peak Wilderness, with highlights such as Rockpile and Marie lakes. Climb Diamond Peak: You don’t need ropes to ascend the dramatic shield volcano that rises over Willamette Pass. The route goes off-trail and requires around 12 miles hiking and more than 3,500 feet of climb, but you can start the journey from the PCT at Summit Lake. Timpanogas and Indigo Lake: These two very pretty mountain lakes can be reached with a fairly short drive from Summit Lake. From a campground at Timpanogas Lake, hike 2 miles to Indigo Lake or explore other trails. Windy Lakes: A trail visits multiple mountain lakes from a route that begins near Summit Lake off awful FS Road 398.